The Huawei P10 and P10 Plus will launch in March or April this year. This was revealed by the company’s Chairman and CEO of the consumer division Yu Chengdong. 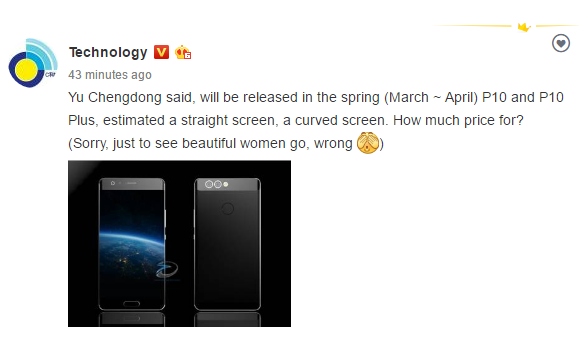 The post seemingly also reveals that the P10 will have a non-curved display, while the Plus variant will come with a curved screen. Previous rumor from last month said the P10 will also come with a dual curved screen. Specs-wise, rumors say the P10 (and P10 Plus) will be powered by a HiSilicon Kirin 960 SoC and will sport a 5.5-inch QHD touchscreens. RAM is going to be 6GB, while storage will top out at 256GB.